Mali, officially the Republic of Mali, is a huge, landlocked nation in West Africa that is about two-thirds desert. The country is named after the Mali Empire, one of several pre-colonial empires and kingdoms, and is the site of the legendary Timbuktu, a key trading city at the time. Today, Mali is one of the poorest nations of the world, and most of its people engage in agriculture in the wetter south. Gold and cotton are its primary exports, but because it has no access to the sea it depends on its neighbors for access to ports. Human rights are generally respected, though problems remain, including trafficking in children, domestic violence and discrimination against women, and child labor. The Mandé peoples settled the Sahel, including present-day Mali, and formed a succession of Sahelian kingdoms, including the Ghana Empire, the Mali Empire, and the Songhai Empire. Timbuktu was a key city in these empires as an outpost for trans-Saharan trade and a center for scholarship. The Songhai Empire declined after a Moroccan invasion in 1591. Mali was invaded by France starting in 1880 and then annexed as an overseas department. The colony, which at times also included neighboring countries, was known as French Sudan or the Sudanese Republic. In early 1959, the union of Mali and Senegal became the Mali Federation, which gained independence from France on June 20, 1960. Senegal withdrew from the Mali Federation after a few months. The Republic of Mali, under Modibo Keïta, withdrew from the French Community on September 22, 1960. Keïta was the victim of a coup in 1968, bringing to power young officers belonging to the Military Committee for National Liberation. When the committee broke up, a single party emerged and ruled until 1991. Public opposition to the single-party regime led to a coup in 1991, a transitional government, and a new constitution. In 1992, Alpha Oumar Konaré won Mali's first democratic, multiparty presidential election. Upon his reelection in 1997, Konaré pushed through political and economic reforms and fought corruption. In 2002, he was succeeded in democratic elections by Amadou Toumani Touré, a retired general who had been a leader of the 1991 democratic uprising. He is widely credited with restoring democracy. Under Mali's 1992 constitution, a president is elected for a five-year term as chief of state and commander-in-chief of the armed forces. This president appoints the prime minister and chairs the Council of Ministers, which adopts proposals for laws submitted to the National Assembly for approval. The constitution defines Mali as being a multiparty democracy and prohibits parties based on ethnic, religious, regional, or gender lines. The National Assembly is the sole legislative arm of the government and currently consists of 147 members. Members serve five years. Eight political parties are currently represented in the assembly. ADEMA currently holds the majority among these groups. Mali is divided into eight administrative regions, which are made up of districts. These districts are composed of communes, which contain villages. Since decentralization plans began, a total of 702 local municipal councils have been formed. These are headed by elected mayors. The Malian legal system is largely defined by the country's former colonial status under France. Moves have been made to change this system to more closely conform to the culture of the country, but many laws of the French era remain in effect. The judiciary is defined by the constitution as being an independent body. Currently, judges are appointed by the Ministry of Justice. Mali has both a constitutional court and a high court of justice. Mali borders Algeria on the north, Niger on the east, Burkina Faso and the Côte d'Ivoire on the south, Guinea on the southwest, and Senegal and Mauritania on the west. Its straight borders on the north stretch into the center of the Sahara Desert, while the country's south, where the majority of inhabitants live, features the Niger and Senegal rivers, as well as their tributaries. At 478,734 square miles (1,240,000 square kilometers), Mali is the world's 24th-largest country (after Angola). It is comparable in size to South Africa and is nearly twice the size of the U.S. state of Texas. Mali is mostly flat, rising to rolling northern plains covered by sand, with savanna around the Niger River in the south. The hills of the Air Massif and Djado Plateau lie in the northeast. Most of the country lies in the Sahara Desert, which produces a hot, dust-laden harmattan haze common during dry seasons and leads to recurring droughts. Southern Mali is wetter, and consequently has more natural vegetation. The nation has considerable natural resources, with gold, uranium, phosphates, kaolinite, salt, and limestone being most widely exploited. Mali is among the poorest countries in the world, with 65 percent of its land area desert or semi-desert. Economic activity is largely confined to the riverine area irrigated by the Niger River. About 10 percent of the population is nomadic, and some 80 percent of the labor force is engaged in farming and fishing. Industrial activity is concentrated on processing farm commodities. Mali is heavily dependent on foreign aid and vulnerable to fluctuations in world prices for cotton, its main export along with gold. Almost one-third of Mali's population depends on cotton for their livelihood. Mali exports some six hundred thousand tons of cotton a year. Mali has urged that richer nations drop their subsidies to cotton farmers, arguing that they depress prices and restrict its farmers' access to export markets. In 2006, the United States agreed to provide Mail $461 million over five years to fund improvements to the international airport at Bamako. This was aimed at stimulating tourism and allowing more efficient handling of exports. Other main crops are rice and peanuts. Several multinational corporations are increasing their gold mining operations, and Mali has emerged as the third-largest gold producer in Africa, after South Africa and Ghana. Mali's population consists of diverse sub-Saharan ethnic groups sharing similar historic, cultural, and religious traditions. Different ethnic groups took up different livelihoods: farming, fishing, and nomadic herding. The contacts among them created links of all kinds that led to intermingling of the ethnic groups. Exceptions are the Tuaregs and Maurs, desert nomads related to the North African Berbers. The Tuaregs traditionally opposed the central government. Starting in 1990 in the north, Tuaregs seeking greater autonomy clashed with the military. In 1992, the government and most of the opposing factions signed a pact to end the fighting and restore stability in the north. Its major aims are to allow greater autonomy to the north and increase government resource allocation to what has been a traditionally impoverished region. Approximately 90 percent of Malians follow Sunni Islam, but not always to the exclusion of traditional religious beliefs and practices. Muslims have their own educational systems, leading in some cases to the equivalent of baccalaureate and doctoral studies. An increasingly large number of Muslims make the pilgrimage to Mecca and study in Arab countries. Christians comprise about 5 percent of the population. Under French colonial rule, the introduction of missionaries into predominantly Islamic areas was discouraged. Literacy in French, the official language, is low and is concentrated in the urban areas. The government has expanded literacy considerably since 1960 by stressing education at the primary and lower secondary levels, but the lack of resources to build and staff enough schools remains an obstacle. Girls' enrollment is lower than boys' at all levels, partly due to early marriage. Literacy rates among girls are much lower than for boys. 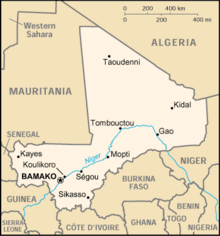 A national university was established in Bamako in the 1990s. Human trafficking remains a problem. Children are sold to work in rice fields, and boys to work in the mines. Girls are sold into domestic servitude. Though the government is trying to curb it, Mali remains a source, transit area, and destination for trafficking. Mali's constitution protects freedom of the press, and its broadcast and print media are considered among the most free on the continent. In addition to the state-run print and broadcast media, Mali has over 40 private newspapers and 50 private radio and television stations. About 70 percent of Malians, especially women, produce arts and crafts, including leather work, gold jewelry, wood carvings, pottery, basketry, and hand-woven blankets and cloth. Mali is the home of some of the stars of African music, and the stardom of the late Ali Farka Toure in particular drew tourists and record producers to Bamako. Toure and others have linked the birth of American blues to the music played along the Niger River. ↑ Presidency of Mali, L’Hymne National du Mali Symboles de la République. Retrieved December 1, 2011. ↑ Mali preliminary 2009 census. Institut National de la Statistique. Retrieved December 1, 2011. ↑ 3.0 3.1 3.2 3.3 Mali. International Monetary Fund. Retrieved December 1, 2011. Central Intelligence Agency. Mali. The World Factbook. Retrieved June 19, 2007. Thompson, Chrissie. $461 Million Grant will help Mali Invest in a Brighter Future. Washington Times, November 20, 2006. Retrieved June 19, 2007. United Nations Human Rights Council. Mali. Retrieved June 19, 2007. U.S. Department of State. Mali Retrieved June 19, 2007. This page was last modified on 8 August 2018, at 16:22.